News from dancers and dance leaders across the UK. Our group in Oxford has been running for nearly two years now. We have four leaders; Susannah, Vicky, Clare and Radha who are all supported by Adrian on the guitar. We meet once a month on the second Saturday of the month. When we first met we were all keen dancers, some of us had been dancing for many years and some of us had attended the dance leaders training course. We all wanted to have the dances in Oxford but none of us felt able to lead or start a group alone. Rather than complain that there was no one in Oxford leading dances we realized that it was up to us to make this happen. So, this is what we have done! At most sessions the four us lead a couple of dances each with Adrian on the guitar. This supportive, collaborative way of working has made it possible for us all to step out of our comfort zones, find our voices and confidence and lead dances. It has been transformational. We each bring something different to the dances and are drawn to different traditions which adds to the richness of our collaborative approach. There is also the added bonus of being part of a group in that if any of us is unable to attend a session the others can still hold it. We welcome visiting dance leaders and musicians to lead or play with us if they wish. Sky has led dances with us on a number of occasions as have Rissa, Alan, Jane and Jackie. We have also been lucky to have Felix on his viola, Phil on his guitar, Jackie on the piano and guitar and Moses on the drums. At our sessions we have anything between 8 and 18 dancers, but not usually less than 10. We have a varied and changing group of dancers with some regulars who will never miss a dance and often new people who have never danced before. 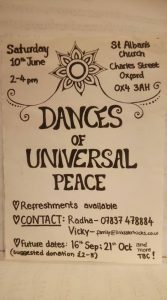 As we have become more established the dances have rippled out to other groups in Oxford and we are drawing more people in. The group is evolving in a very natural and organic way. Apart from meeting to run the sessions the 5 of us meet on two other occasions each month; once to rehearse and once to de-brief after the session. For us to lead together, in a coherent way, we have found it is really important to make this time together. We all feel very proud that DUP is now established in Oxford, it is gathering momentum and it is up to us to let the dances flow. So, on with the dance! This entry was posted in News on 17th March 2019 by Sarah McCulloch. Old connections deepened and friendships rekindled, and new meetings, most particularly with visiting leaders from abroad. A sense of newness and excitement – overspill from Arjun’s “caravan” which travelled through Turkey and elsewhere, sharing dances where perhaps they’d never yet been seen. Fresh, ardent sweetness. A space where everyone who wished could share a dance. Diversity, tenderness, vulnerability, power, surprise. Conversations about shared and contrasting experiences as dancers and leaders. How is it to lead with children? With people who “stumbled upon” the dances rather than explicitly choosing to attend? 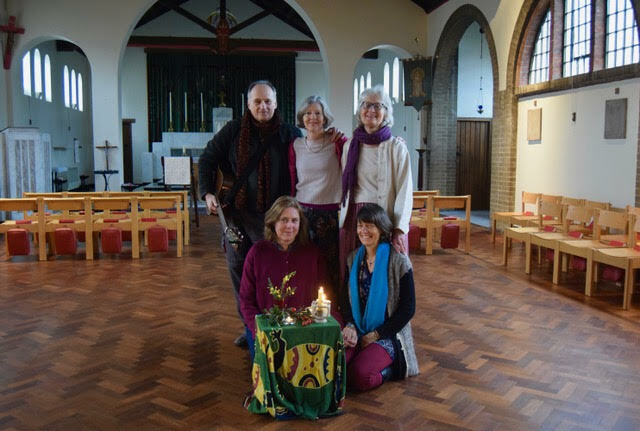 With people from faith communities whose traditions have inspired our practices – or with people uncomfortable with those faiths? Noting a wide variety of experiences – some dancers upset by perceived “appropriation” and adaptation of their culture, others happy and moved, perceiving a recognition and embrace. To be careful to share only what we know, to be honest in expressing our limitations and to invite the sharing and insight of dancers in our circles who may more directly transmit a particular heritage. At the same time, acknowledging our own legitimate place within a silsila – a lineage and transmission with its own unique flavour. Morning practices, before breakfast and coffee – perhaps a more inward space of quiet awakening. A few notable and last-minute cancellations, each a friend whose presence was acknowledged and missed. Throughout, though not exclusively, a focus on the original dances and other practices of Samuel Lewis. 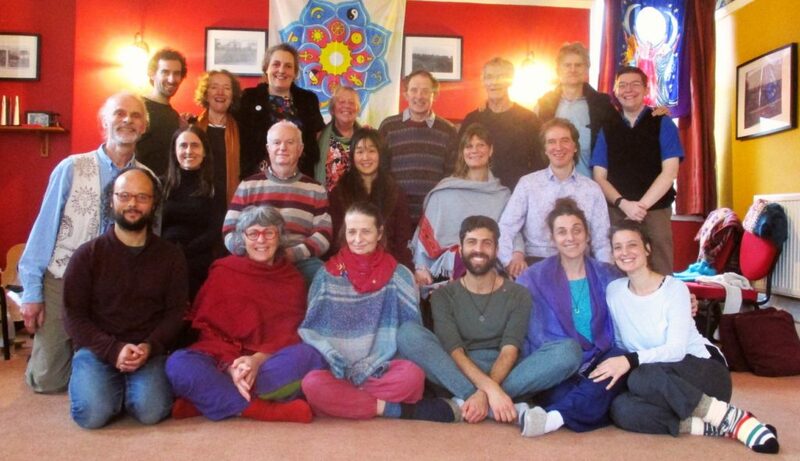 A wide variety of orientations to SAM, ranging from perhaps mild aversion through to committed practice and study and engagement with his still-living original disciples. Noticing the power and directness of his dances, not necessarily requiring musicality, but absolutely demanding alertness and concentration. 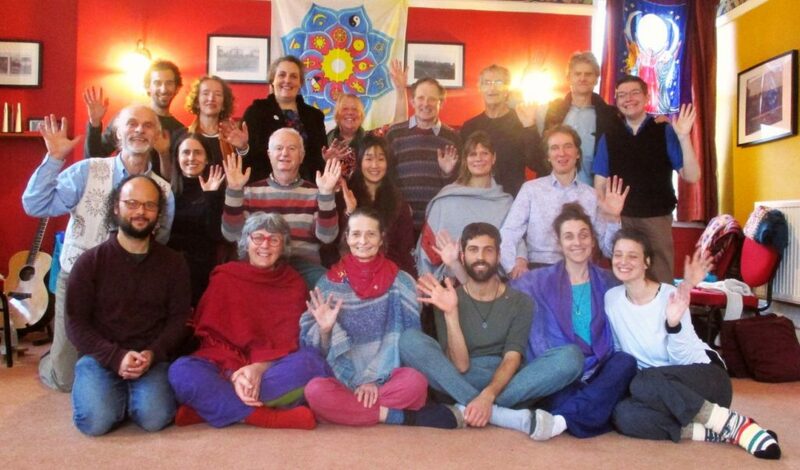 Returning home with renewed commitment to this path and its associated community – feeling connected, held and loved. So welcome in these cold and dark days of winter! This entry was posted in News on 6th February 2019 by DominicA. Four of us have been leading dances together in a local church for just over a year, and generally attract 8-12 dancers: a mix of interested locals, circle dancers, and those who’ve done DUP at Unicorn or Sacred Arts Camp. Radha and I were leading this session, as both Clare and Susannah were away. Adrian, our regular guitarist, was being joined for the first time by Felix on viola and drum. Lots of things were happening that Saturday, so we weren’t expecting a big turn-out: even so, just two people was a surprise… But both had been at SAC, so weren’t new to the dancing. We began with Haida, and followed its upbeat mood with Kol Ha Na’Shama and Mother Earth is a Great Big Ship – and very soon something began to happen. We did less explaining than usual – of words, steps, tune, and general background – which meant we spent more time actually dancing. Adrian and Felix were able to be both playful and expansive in their accompaniment; with fewer of us it was easier to change tempo and dynamics. The last dance before the break was All My Relations, with a more inward and meditative energy, and by then we all seemed to be very finely tuned to each other. We changed the order of dances to finish the session, and dropped the intended ending dance. I led with Fill Your Cup, and Radha finished with the Kalama (we were one week short of the actual 50th anniversary). For both of these we four danced in a line rather than a circle, and were completely in tune and in step with each other. I experienced again the feeling I first had doing DUP (in a small yurt on a Dorset field) – I was no longer sure where I ended and those around me began. So, that’s why I wanted to write about this session! In terms of numbers, and raising money to pay for use of the church, it was our least successful. But what it clarified for me was the reason I love DUP. There was no sense of performer and follower: the six of us co-created the sessions. 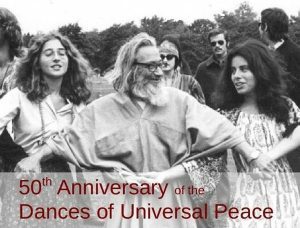 It reinforced that what we do is a practice, and numbers and payment are irrelevant to its success; and that when you are able to let go of too much conscious thought you open yourself to experiencing an amazing harmony with others. Don’t talk the talk, dance the dance! This entry was posted in News on 2nd October 2018 by Sarah McCulloch. What a delight this e vening was – over 30 people came, some familiar with the Dances, some new to them – but all feeling inspired to come and join in with celebrating SAM’s legacy. People arrived bearing food to share at the break – much variety and deliciousness. Fateah graciously doubled as compere and dance leader, while the other 4 of us (Jenny, Sarah, Dominic and me) led half hour Dance sessions, with an hour in the middle for eating and talking. Gavin and Clare provided extra musicianship, Monika brought the ice-cream (in cool bags as there was no freezer!) and Isabel oversaw the refreshment table and washing up. Krytstyna sorted and arranged the flowers brought from gardens. The collaboration and cooperation was a joy to be part of. What a privilege, what a blessing, to gather in a small field on the mainland and having stowed luggage on board the trailer, to make our way on foot down to Porth Meudwy and the boat to Enlli. How moving to be with those drawn to retreat, to this sacred place of pilgrimage, to the universal ancient way of knowing that sacredness, the Goddess. Leaving behind our everyday lives, taking steps to re-membering, not just our relationship to the Divine but also to ourselves, all our selves. Enlli, a sanctuary of abundant life in the sea, the air, the earth. Summer solstice, with day after day of sun and heat, light dancing in our elemental beings, as it does upon the waters and crosscurrents, this way and that, textured light and water, crossing and spiralling. 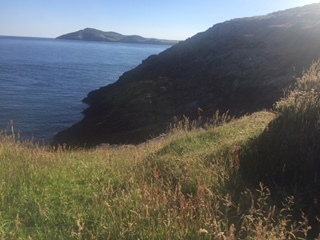 Breathing with seals, hearing their song, sharing practice together on our last morning, ecstatic moments of prayer vocalised and carved in air, dancing body. 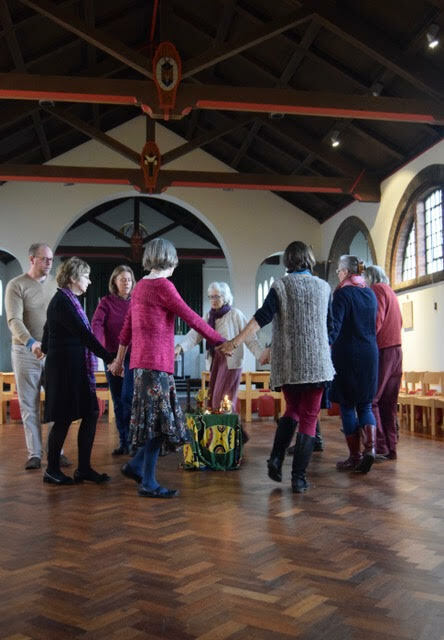 Miss Ruth (Ruth St Dennis) leading the way to finding such freedom in form through her encouragement to join the “Divine Dance”. Dear Kamae (Kamae Amrapali Miller) encouraging movement and expression through this breath, this heart, blessing our Goddess Zikr, remembrance of Her Name, in Unity. Such harmony, eating, dancing and praying together. Such beauty, maybe not surprising walking in Her footsteps but such delightful beauty and so many gifts. The slow worm who nestled in the heat and shelter of the slate sign, the mature one that snaked across our path, the gathering of diving, feeding gannets, so many altogether, the clarity of the still waters (relatively still), revealing layers of rocks, forests of seaweeds, the whole body of our seal friends. Purity of elements as we open to purification, spaciousness, a doorway to vastness, the silence so welcome, the invitation to stop and notice, as all do, the day trippers, the warden, Enlli guardian. Drenched in light we sought the Dark Mother, finding shelter and protection, blessed coolness in her gentle embrace in the shadows. The force of anger, hurt and jolted, opened up a new avenue of healing, searching and re-membering, finding and uniting in the chapel. The unexpected heat as we joined the reunion and rebirth under the full moon. 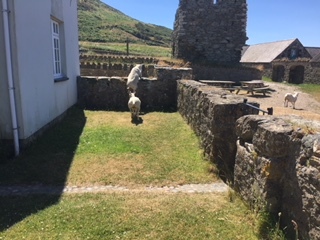 A Welsh chapel feeling more like a Middle Eastern Temple, we danced, we sat, all the while watched over by a feathered friend. Light reflected as well as direct. Sunset upon sunset, each unique and awesomely beautiful, sometimes accompanied by the brass band, music carried on the wind. Pools of salt on dark rocks created by such fierce heat, the altar water evaporating too and needing replenishing. Laughter and tears, harmonies resounding again and again. 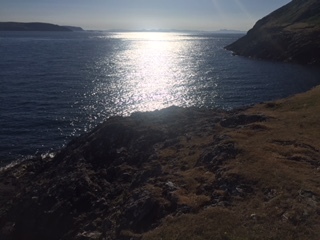 These are glimpses of our retreat on Ynys Enlli, Bardsey Island this year, like individual points of light that dance on water and dazzle the eye. I write as I digest and integrate one of life’s potent, peak experiences. Calling on the Goddess and her Beloved with beloved retreatants, helped me to integrate and heal so much in my own being at a time in my life of intense healing. She guides me through not having a chance to prepare through thought, the head, but forcing me to stay in the heart and to know that all that comes to me through life is preparation, just the right preparation, for ripeness, juicy and full of the greening life force that Hildegard von Bingen spoke of, sang of. How wonderful to receive the “perfect remedy” during retreat for my beloved’s recovery through the generosity of a retreatant. How lovely, full of love, to enjoy so many precious gifts to be treasured in the midst of daily life, to nourish us further on this pilgrimage of life. There is a longing to return……………….. This entry was posted in News on 8th July 2018 by Sarah McCulloch.